The Theresa and Edward O’Toole Library has one of the largest collections of Franciscana west of the Mississippi, including numerous rare books housed in the Copley Library at the University of San Diego. FST students have full access to Copley’s extensive collections and electronic resources. Browse or search USD scholarship, creative works, and more in Digital@USanDiego! 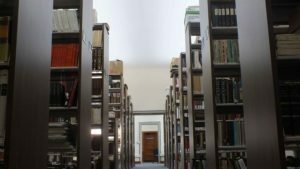 The Theresa and Edward O’Toole Library collection focuses primarily on Franciscan thought and history. Our library is located adjacent to the Sacred Garden in the Mission quad and is open Monday- Friday from 10 am to 6:30 pm. Use of the library is limited to students and faculty of the Franciscan School of Theology and the University of San Diego. Members of FST have full use of Copley Library at the University of San Diego. Items housed at Copley Library may be requested and checked out through the library at FST or in person at Copley library on the USD campus. Electronic resources are available through USD’s databases and journal subscriptions. Access to material housed at regional libraries is available through the Circuit, a consortium of libraries in the greater Southern California area. Interlibrary loan services are also available. Students looking for library services will find information at the following links—including a research guide developed especially for FST students. If you do not see the service you are looking for, contact our librarian for further assistance. FST’s Theresa and Edward O’Toole library has one of the largest collections of Franciscana west of the Mississippi, including numerous rare books housed in the Copley Library rare book room. The American Academy of Franciscan History collection is housed in the Rare Books room at the University of San Diego and comprises over 400 works focused on the history of the Franciscan order in Southern California and the Americas. Contact the FST librarian at (760) 547-1800, ext. 231 for more information or to schedule an appointment to view the collection. Request books, articles, and journals from other libraries when not available through USD libraries or the Circuit. Please review the Interlibrary Loan policies. Students, faculty, and staff may extend the loan period of borrowed materials by the length of the original loan period (i.e., 90 days). Renewal of FST material may be done at the reference desk in the FST Library, by phone or online. To avoid fines, borrowed materials must be renewed by the borrower on or before the due date. In most cases you are sent a reminder notice shortly before the due date reminding you that your materials are coming due, but you are responsible for returning or renewing materials by the due date. FST follows USD’s replacement policy for lost library materials. Materials not returned to FST Library are billed at the cost the library incurs for replacement plus a $40 replacement fee. Patrons can get the replacement cost refunded if the material is returned and the late fine is paid. Borrowing privileges are suspended once a student accumulates $20 in fines. Members of the FST community may borrow library materials for a period of 90 days. Patrons are limited to checking out a maximum of 10 items at any given time. To maintain a study atmosphere in the library please turn your mobile phones to mute before entering and restrict any speaking to necessary comments so as not to disturb the study of others. Quiet conversation is permitted only in the front of the library, where the reference desk and copy machine are located. All other areas of the library are considered quiet zones. No food, please. Beverages in approved containers only. The FST library committee meets once every semester and consists of the library director, vice president, a faculty member and a student representative.